The photo above is an overall shot of the plate. The two gravers that were used are lying on the plate rotated so that the heels of the gravers are visible. The upper row of cuts were made using the uniform point, and the lower row were made with a traditional point. 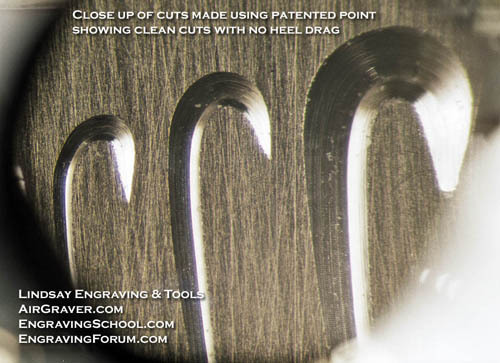 The Uniform Parallel point™ is similar to having two flat graver points joined together to form a V. While engraving, lean it to one side or the other and it will cut wide like a flat point. This makes the point versatile and allows a person to vary the width of the cut from thin to thick easily. 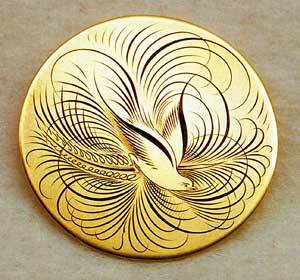 The engraving to the right would have been difficult if not impossible to execute well without this point. Being able to vary the width of the cut using one point to create fine banknote lines and wide lines gives the artist the ability to express himself easily. One pre-sharpened Carbalt™ graver with this point is included with each customer's first purchase of an AirGraver handpiece. 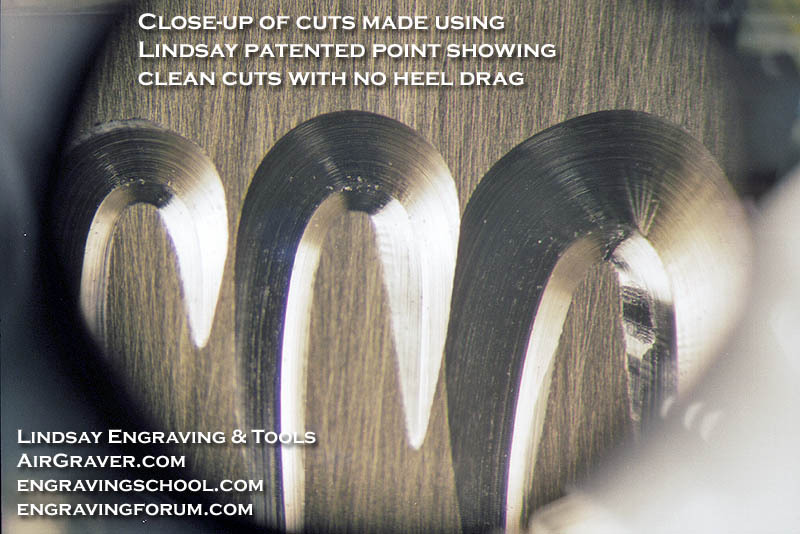 The Lindsay sharpening system easily and accurately grinds the patented point. The heel relieving graver can go deeper into the metal than a traditional graver point using the same power level. 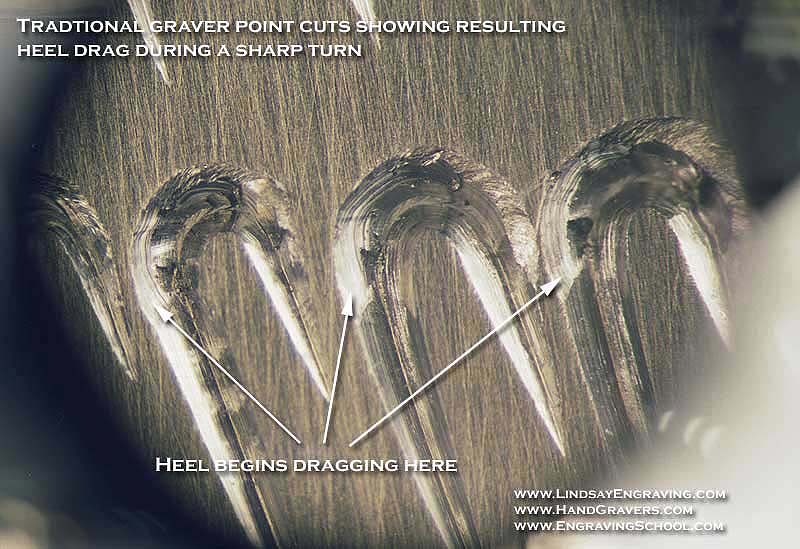 The heel on the traditional graver point is actually giving more resistance as it is driven through the metal. This is especially evident around corners like those illustrated in the above plate above. While making a cut, the traditional graver tends to come up out of the metal, and it is therefore necessary to push straight down on the point itself to hold and keep it in the cut around the corner. 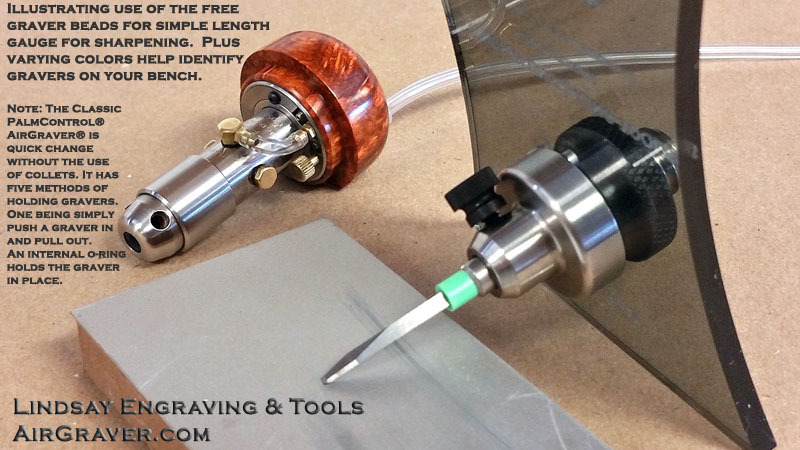 This is why various books and instructions in the past advised engravers to hold their index finger on top of the point and push down to keep it in the cut when using a power assisted tool. 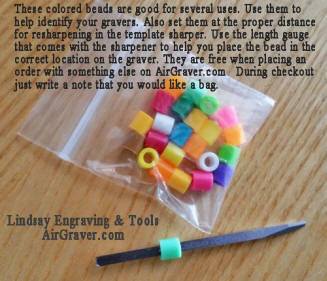 This is necessary with the traditional graver, or it would be out of the cut and sliding across the work. The downward pressure, however, also contributes to casting a bur on the edge of the cut. The downwards push is trying to force the tip to do something it refuses to do. 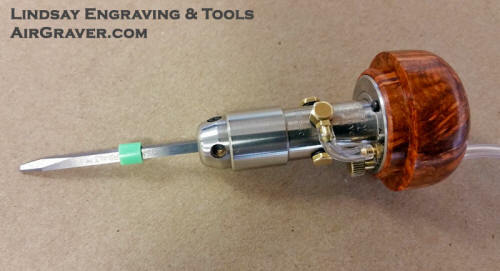 This will help raise burs, and may require sanding the surface of the engraving when finished. 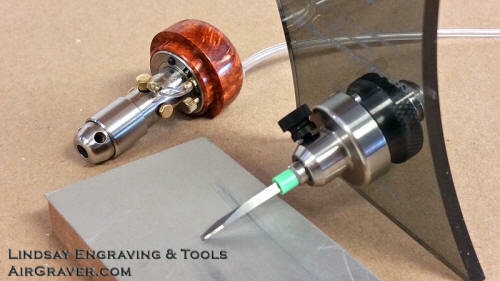 After engraving, the surface should not need to be sanded or re-polished. If sanding is necessary, there is something wrong with the graver point. 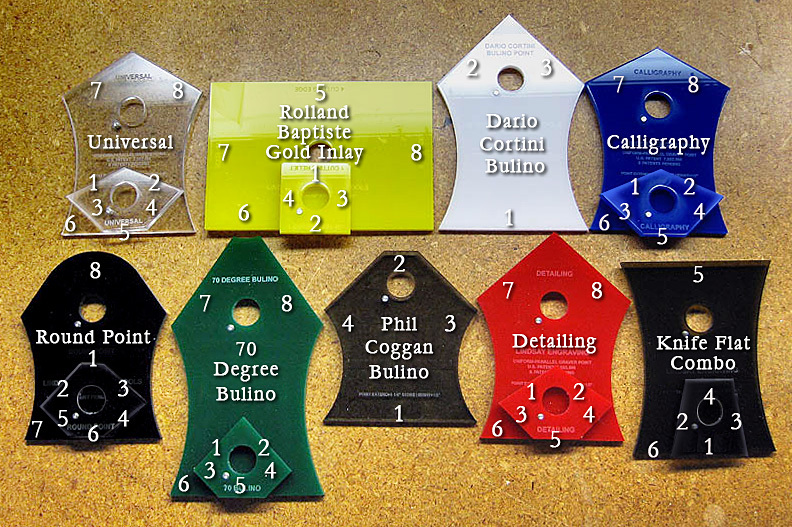 Sanding takes away the grays that were achieved while shading, and will lighten the overall engraving. It will also leave white streaks in the grays of the shading. The patented point solves this by making downward pressure unnecessary. 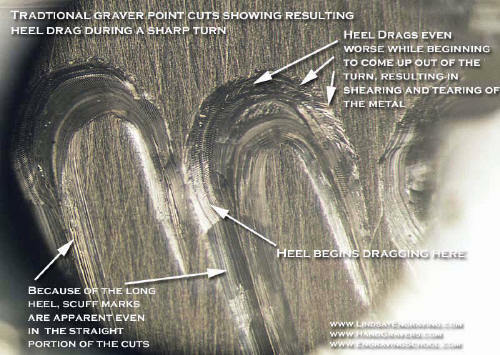 The uniform parallel geometry has a shorter heel because of the secondary relief facets, and allows the cutting edge to go through the metal cleanly. The point more efficient in cutting, and required less power than a traditional point to execute a cut of the same depth. 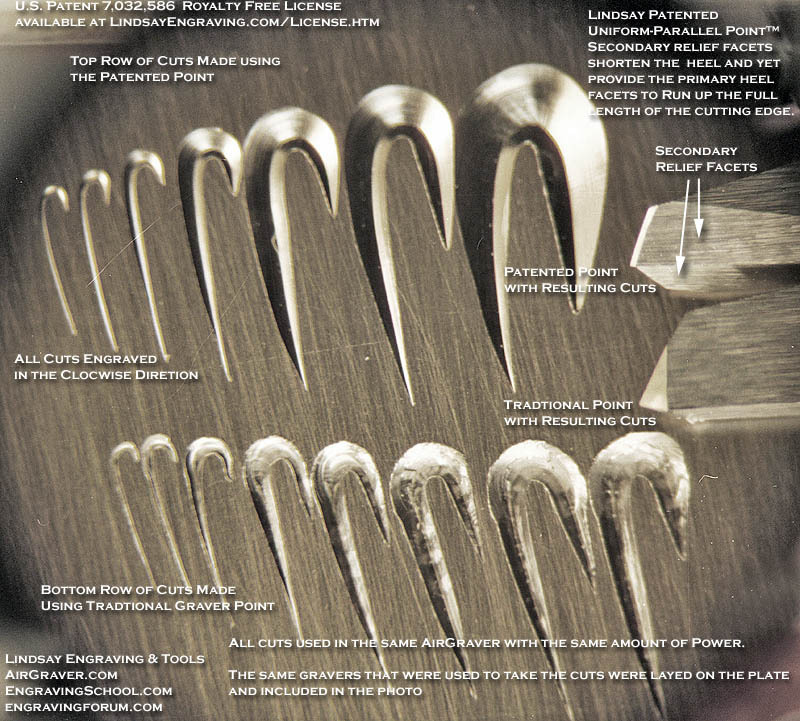 The cuts in the sample plate illustrate this by the dramatic increased depth seen in the cuts made by the patented geometry, given the same amount of power and impact frequency as the traditional point cuts. Since the point is cutting more easily, there is less force on it, and therefore the breaking of points is less likely. 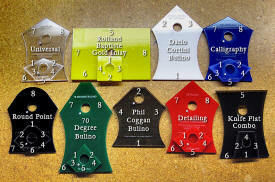 The system uses inexpensive templates to reproduce various points easily and accurately. Tim Wells video of the process with a power hone.